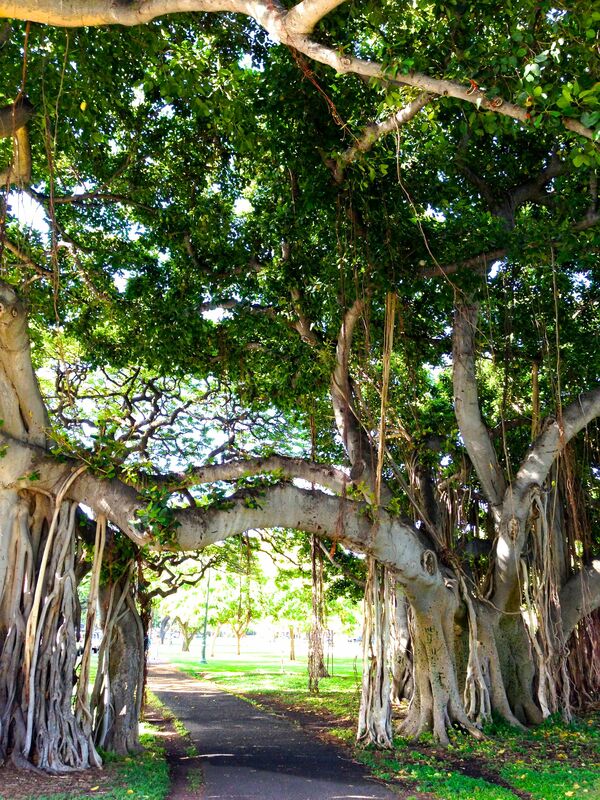 The rich complexity of the Banyan tree arching over the Kapiolani Park walking path reflects our own inner complexities. Yesterday was a lovely full day — a day in which I opened my heart to receive help. While sitting in silence in Centering Prayer, I met “The Marshall.” That’s the officer charged with the training and discipline of the soldiers assigned to a medieval castle. As I read the list of medieval offices the day before I did stop on that one and think . . . hmm . . . discipline. I need that. Imagine my surprise, God, when The Marshall appeared inside me as an avuncular Scot with a charming accent and a supportive and encouraging approach. His enveloping warmth and certainty that I can “do it” had me picking up my 5 pound weights several times yesterday and today. He also had me stretching and feeling very good about it! I sure wish I had met him years ago. His positive, compassionate and encouraging spirit are a tonic! A friend asked me this morning, “How long do you think this will last?” I didn’t have an answer then but this evening the answer came. It will last as long as I stay humble enough to “receive” the help. That’s the Key, isn’t it, God? Humility. Enough humility to know that I am falling short and need help. And then on-going humility so that I am open during the day for opportunities to be guided, nudged or rounded up and sent out for a run. On further consideration it also means scheduling my day at a slow enough pace so that there is space enough for helpful “interruptions.” I think redoing my schedule will require the help of the Lord of the Privy Seal. Oh my! So many helpers and I need them all!